Obvious common points of departure are (i) the acknowledgment of the limitations of models of market dynamics centered upon the behavior of a mythical representative agent endowed with unbiased forward-looking expectations, and conversely (ii) the challenge of nesting the theory into an explicit account of heterogeneous, interacting agents. Some forms of heterogeneity in information and beliefs can be incorporated into analytically tractable models (see for example the information-related heterogeneity in Grossman and Stiglitz, 1976 and 1980, the diversity of beliefs associated to the presence of noise traders in De Long et al. 1990, 1991 and Schleifer and Summers, 1990, see also Blume and Easley, 1990). However, analytical tractability poses heavy constraints on the forms and degrees of heterogeneity, as well as the forms of learning, one can handle. Moreover, one is forced to analyze almost exclusively limit (equilibrium) properties of the models, and neglect finite-time properties which might nonetheless be the most relevant for comparison with empirical data. The artificial market approach tries to overcome these drawbacks by explicitly simulating populations of interacting agents who might endogenously evolve beliefs, behaviors and mental models (Marengo and Tordjman, 1996): FTR has been build on the grounds of the same basic philosophy. In FTR we stress two type of strategic investment approach to financial markets that clearly characterize two kind of different agents: fundamentalists and chartists. Obviously each of the two kind of agents can be modeled in different ways: from very simple algorithms to very complex ones. FTR allows also to mix the strategy types in the "heads" of single agents, although, of course, the more complex are the mental models of the agents the greater the amount of code that the analyst has to write. Furthermore we emphasize the specific architectural traits of markets, i.e. the mechanisms on the basis of which interactions among agents occur. We have characterized, as initial instances, two different models; namely, first, a centralized market -- that is, in actual fact, an auction, and, second, a quite general instance of a decentralized market that is the more general model for decentralized trading that you can design. In decentralized markets an agent who seeks to trade can meet a certain number of traders (notionally ranging from one in a pairwise matching setup to every agents) that accept (i.e. are available) to trade. Seeking/accepting attitudes allow to model a wide range of market structures. For instance dealers or specialists, present in certain type of markets, can be modeled as ``ever-accepting'' agents. FTR, by allowing different physics of interaction and different types of behaviours which are legal in a given market architecture, makes it possible to represent a wide ensemble of market architectures. 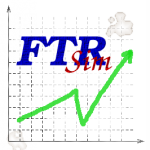 FTR, when compared to other artificial markets, enlarges the scope of analysis in several respects. First, FTR entails easy experimentation with different types of agents, both in terms of behavioral and cognitive patterns, and in terms of learning procedures. Second, it allows exploration of the properties of different architectural and institutional traits, especially with respect to the physics of interactions (e.g. the specific mechanism for decentralized encounters), and the information availability by individual traders or groups of them. Third FTR allows to represent time in alternative and possibly quite sophisticated ways. In an artificial world, modeling time is indeed a tricky issue. Basically, there are two alternative ways to run clocks in an artificial market. First, one may think of a time-driven model in which one attempts to reproduce some exogenous clock whereby for each unit of time a variable number of events may occur. Second, one may build event-driven models, whereby the clock counter is increased by one unit whenever some event occurs. Both representations are possible in FTR. In fact, FTR embodies an explicit time-embedding of events that allows us to easily represent asynchronous and/or diversely paced ``clocks'' for diverse classes of events at the system and individual level (e.g. buying and selling -- trading, vs. accessing news, vs. making trading decisions, vs. learning, vs. updating). Relatedly, FTR naturally allows us to study the dynamic properties of the system on different time-scales. And moreover it allows to experiment with both models of time: e.g. time-driven model for the market clock and event-driven for the clocks in the minds of agents. Holding individual characteristics (i.e. cognitive/behavioral patterns, and possibly learning processes) and information regime constant, what happens if one changes the interaction regimes? Holding the institutional set-up (i.e. interaction and information regimes) constant, what happens as one varies the "ecology" of cognitive/behavioral patterns and learning processes? So, for example, simulation experiments will allow us to assess whether observed statistical regularities (e.g. the so called "ARCH" effects, "fat tails", etc.) are generic properties, holding over a wide range of interaction regimes and "ecologies", or conversely, whether such regularities are conditional to very specific institutional set-ups and distributions of agents' "types". Let us emphasize that FTR is still at a construction stage, still operating under modeling simplifications which shall be eventually overcome. So, for example, for the time being, each agent can exchange only one unit of asset in each transaction it is engaged in. In the near future we will modify the code to allow rules by which agents can exchange more than one unit and, further down the line manage their portfolios.